A few months ago I had my first British bespoke suit made. Time, I thought, to repeat the experience in shirts – so I toddled off to 23 Bury Street, home of Turnbull & Asser’s bespoke service. I’ve been a fan of Turnbull & Asser’s shirts for a while, and wrote a while back about the vast improvement that has been made in the block for their ready-to-wear shirts. How many men with a 15-inch neck wanted that big a waist on their shirt I’ll never know. The new line is much slimmer, and fits better than some made-to-measure I’ve had done. Bespoke is made in almost exactly the same way as ready-to-wear, and all in the Gloucester factory. But the difference is the fit. 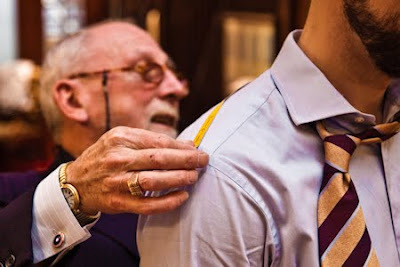 I have to say being measured by master shirt maker David Gale was an eye-opener for me. The attention to detail in body and personal habits was greater than any other tailor I’ve had. Take the width of the cuff, for example. Obviously this is dependent on the width of the man’s wrist. It should be tight enough to that wrist such that the cuff stays at the base of the thumb and does not slip further down. That allows the shirtmaker to build in around an inch of excess material in the sleeve length, above the wrist, so that when a man’s arm is extended the shirt goes with it. However, some men wear large watches on their wrist, making it impossible to keep the cuff tight enough to prevent slipping down the hand. So instead, the cuff is made larger but there is no excess in the sleeve length. To still allow for movement of the arm, a slight excess is built into the back of the shirt, rather than the sleeve. The same process would be used for a man that prefers to put in his cufflinks before he puts the shirt on. The cuff is made a little wider and the sleeve a little shorter, without that excess material. Equally for a man with particularly thick wrists in proportion to his hand. I do wear large watches, but I also have slim wrists – so it balances out. It also makes a difference what type of cuff link you wear. A silk knot keeps the cuff very tight; a bar is rather looser; and a chain is looser still – even if they are the same length, the looseness of the chain means it forms a bigger circle than a bar. This is as important as the thickness of your wrist. My first commission was for a white dress shirt, in Sea Island Quality cotton. This is not actually from the islands off Georgia and South Carolina, as Sea Island cotton originally was, but from the same plants transported to Egypt. I was told that the cotton you get today from the area is monopolised and thus overpriced. In T&A’s opinion, Sea Island Quality feels better anyway. I’ve felt true Sea Island cotton and it is heavier and silkier. Whether that is better is really a question of taste. The shirt will then be worn and washed two or three times, before being presented to David for a fitting. Then the adjusted paper pattern goes back to the factory to be made into a final shirt. Watch out here for reports on both stages. You can follow the discussion on Turnbull & Asser: My first British bespoke shirt by entering your email address in the box below. You will then receive an email every time a new comment is added. These will also contain a link to a page where you can stop the alerts, and remove all of your related data from the site. Can you give us a cost approximation of a T&A bespoke shirt? From around £185 and up. Damn good value if you look at the price of designer shirts – most of which are made in China and none of which will fit. The biggest hurdle really is the minimum size for your first order, usually six. That makes the first bunch an investment on the scale of a bespoke suit. But one still worth it in my opinion. Like many things bespoke, it is an investment. 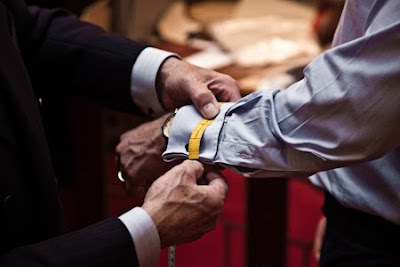 The shirts can be altered, looked after and have their cuffs and collars changed over time. Without dry cleaning, they should last decades. Simon…Nice piece…do you know if the outfit in NYC can provide the same level of service…in terms quality and expertise. You should check, I believe Turnbull has a New York location. I’m afraid I don’t Taylor, no. Best to contact T&A yourself – number’s on their website. Lovely Blog, very informative. Quite an investment, minimum of six initially, indeed yet one that is worthwhile given the shirts’ quality and projected longevity. hi, simon i was wondering if you had any advice on tailors in london who are able to adjust shirts (esp at the waist to avoid bunching of material)? are there any you are able to recommend? Simon, it is a few years since you wrote this article and I note that you have moved onto the neapolitan shirt makers in this time. 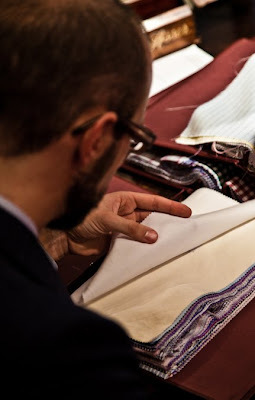 Based on the fact that most British shkrtmakers do not do fittings on their bespoke shirts and there is very little hand stitching, do you think there is much value of bespoke over made to measure? Jermyn street makers such as Harvie & Haddon offer both, and I am wondering whether it is worth paying for the bespoke option when, especially for the first shirt, the fit is unlikely to be spot on? Most do do fittings for bespoke in my experience? Simon, I know you’ve moved on to Neapolitans since this article was first published but as a more general question – I’m looking to have my first bespoke shirt made but am a cautious buyer and would rather take this step with a shirtmaker who put no minimum on their first orders (though I do understand and appreciate the reasons behind minimum first orders). I’ve heard smaller shirtmakers such as GuyField have no minimums but have no idea about their quality. Would you have any suggestions?